I can’t think of anything that brings more joy to my children’s faces when it’s the dead of winter or a rainy spring day and I tell them to go grab their swimsuit and pajamas because we are headed to an indoor water park for the night. Whether you are looking for a fun overnight getaway or want to spend the day splashing in the water, there are so many great indoor water parks in Ohio to choose from. So grab your towels and goggles as we explore the thrills, slides and best lazy rivers that Ohio has to offer! With so many locations to choose from, there is sure to be one (or more) that is perfect for your family! 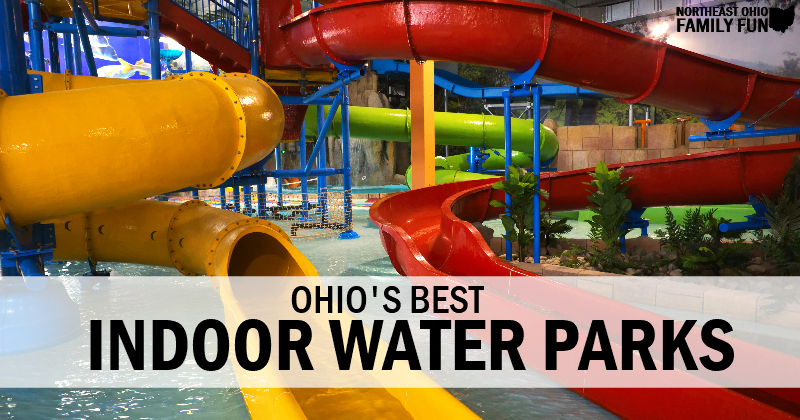 As usual, if you know of any other Indoor Water Parks in Ohio that should be included in this list, submit the details here and we'll get them added. Thanks! One of the closest hotels to Cedar Point, this tropical themed resort has something for everyone. In addition to the waterpark, there are three restaurants, an arcade, a children’s craft and activity center, and retail shopping. Children three and younger do not require day passes. Located on a beautiful 18 acre resort, this waterpark is great for a long vacation or a weekend getaway. There is a zero-depth pool for the little ones and a large tube slide for the older kids. There is also a playground, biking trails, basketball courts, and a botanical garden on the property. Day passes are also available and children under three swim free. This hotel is great for a fun, affordable, weekend getaway. The waterpark is reserved for guests only and includes a waterslide, a rain umbrella, and a lazy river. This is perfect for toddlers that aren’t ready for the crowds of some of the big waterparks. With two locations in Ohio and waterpark passes included with your stay, this is a great option for a weekend getaway. They also offer story times, character appearances, other great activities to keep your children occupied. However, the waterpark is for overnight guests only. America’s largest indoor waterpark boasts an array of activities for children of all ages. They also have dry activities including an arcade, mini golf, and laser tag. Children two and younger do not require day passes. DEAL ALERT -> Over Half Off Overnight stay at Kalahari – includes waterpark admission, overnight stay and $100 game card! A Hawaiian themed resort, offers an arcade, two restaurants, and is more affordable than some of the bigger resorts in the area. However, this resort is not as infant/toddler friendly since you have to pay for anyone entering the waterpark. Located down the street from Cedar Point, Rainwater Park has an indoor and outdoor waterpark, an arcade, laser tag, bowling, and miniature golf. However, the hotel is located directly behind the popular bar “The Thirsty Pony” which has the tendency to be very loud in the evening so if you plan to stay the night it might not be the best option for those with young children or light sleepers. Day pass packages are available. Formally known as Coco Key Water Resort, this waterpark came under new management and reopened with extensive renovations in May 2016. Affordable half and full day passes can be purchased and accommodations are available at the Ramada Plaza Hotel. This waterpark is small but has something for kids of all ages. With a retractable roof be prepared with sunscreen if you are going in the warmer months. Day passes are available only on select days so make sure you call before going. We have three children 7,11 and 14 . They had a great time at Splash Harbor in Belleville. The hotel is not bad and there are some good places to eat close by and its affordable. Cherry Valley Lodge Coco Key Water Park closed last fall.